Basilica of st. John the Baptist is one of the most precious object of Pomerania and simultaneously the most important historic building in Chojnice. It was built in 14 th century in place of an old wooden church. Monumental, three nave church (length 46,2m, width 19,6m, height 14,6m), built in years 1340-1360 from red brick, on granite foundation, in Pomeranian gothic style. In the basilica crypt found eternal rest, inter alia remarkable painter, know mainly in Europe - Herman Han (died 1628) and great, even though less famous artist Franciszek Haeflich (died1756). Illustrious painter Herman Han was born in 1574 in Nysa. 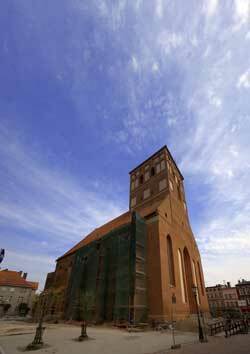 After finishing practice in his father's workshop he settled down in Gdańsk . He died in 1628 in Chojnice. He had a lot of students and followers and left a huge artistic heritage. A lot of oral transmissions indicated that there are more crypts in the church. 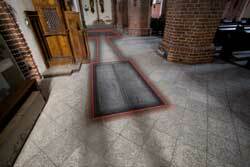 Therefore priest Dawidowski's suggestion that similar crypt may exist also in the right nave, are worth checking. 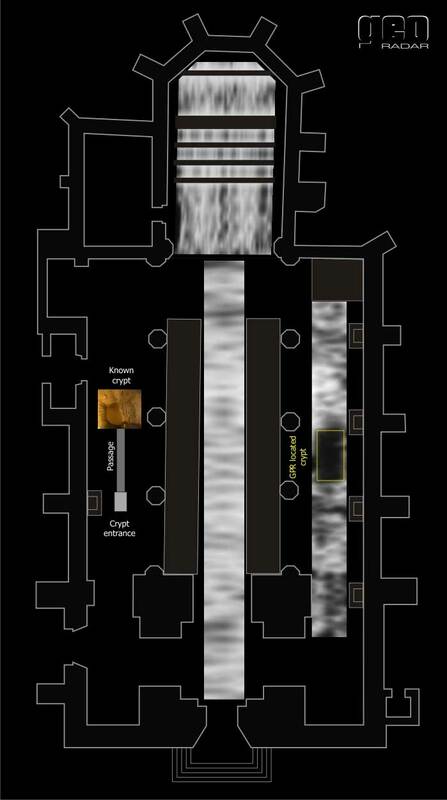 All parts of the church floor were examined. The right chirch aisle was considered as the most probable location of the crypt. The nave and the presbytery were also examined. The result presented below is the effect of the GPR profile . Under the presbytery and the nave there are no crypts. Exept anomalies, which distribution and amplitude exclude existance of empty crypts, there is nothing that could anwser the purpose of the research. Profiles from the right aisle enclose very clear signals, showing the existance of the “twin” cript on the second side of the church. This place is marked as a yellow rectangle on the plan below. Apart from the GPR profile , electrical resistance tomography was used. In this research four sections were used – all in all 32 electrodes at 0,5 intervals. The ERT result confirms previous GPR researches.